In this week’s episode of the Real Deal, we break in our upgraded, sound-proofed, brand new “Batcave” version of Deep Fried Studios situated inside the Container Yard co-working space located on the ground floor of the Marine Street Lofts in Mobile. A couple of weeks ago on a prior podcast, it was mentioned in our Rumor Mill segment the possibility a cryogenic company landing inside a West Mobile strip mall. Johnny G. was certain there were going to be creepy half alive/half dead “popsicle people” stored somewhere on ice in town. DEAL: Mention the code “REAL DEAL” or “Ron and Johnny G. sent me” and get $5 off your first Mobile Cryotherapy single visit or $10 off any Warm Up package or higher. This cutting edge new local healthcare business uses liquid nitrogen (in gas form) to essentially “freeze” your body from the neck down. It is supposed to send your body into “survival” mode that, some experts say, makes you healthier and more attractive. Also in an extended Rumor Mill segment, we had in studio Mobile’s “better version of Sean Hannity” sitting in as a special guest, dishing out the skinny on the very latest local real estate sizzle; popular host of FM Talk 106.5’s weekly Common Sense Town Hall Radio and commercial broker for locally-owned and operated NAI-Mobile – radio veteran Pete Riehm. • Proponents of cryotherapy and why it is so popular among professional athletes and Hollywood Movie Stars. • Anecdotal evidence seen by the podcast host when subjecting himself recently to a cryotherapy session. • Future growth plans in the local market. Expectations of adoption of high tech therapy by consumers in a mid tier market found in Mobile and Baldwin counties. Please subscribe, review and rate Real Deal with Ron SIvak in Apple iTunes, Overcast, Stitcher, Google Play Store and any place you get your podcast fix. For more Real Deal local business info check out lagniappeMobile.com or grab a FREE Lagniappe paper on stands now. Thanks for listening and keep Mobile funky. (Disclaimer: although frequently used, cryotherapy treatments aren’t for everyone and many results mentioned are anecdotal. As with any health-related programs, please consider consulting with a physician before considering this new – but as of yet FDA unapproved – treatment since it is not covered by standard major medical health insurance). 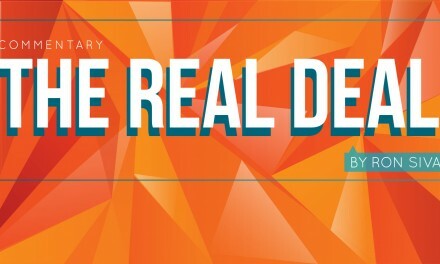 The Real Deal Podcast is produced in cooperation with Deep Fried Studios.